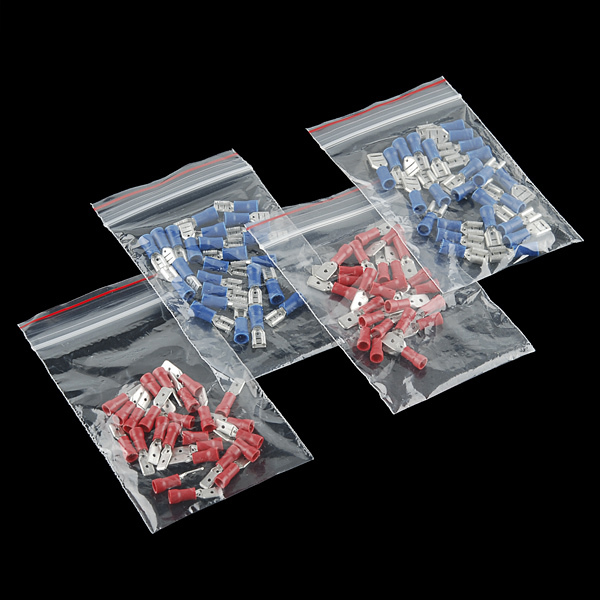 This assortment contains 25 each of male and female, 1/4" and 1/5" quick disconnects! Grab some to keep around your shop so you don't find yourself short for your next project! Red and Blue denote wire gauge, not male or female. This sounds stoopid, but is there a proper way to crimp these? Just mash with a pair of pliers? Looking through parts catalogs I see a zillion different types of crimping tools and I've never been clear on which tool to use with which connector. Automotive tool dealerships often carry a purpose-made "spade connector" crimping tool (often packaged with a bajillion different spade connectors to try it out on). But like Omnikrys says, the "crocodile jaw" wire stripper can be used to do the job quite nicely. The only difference between my crimper and my wire stripper is that the wire stripper works like a pair of pliers with the handles on the opposite side of the pivot to the jaws o' crimping, whereas the crimper has longer handles and the crimping jaw is on the handle side of the pivot, making for less precision but more brute force.